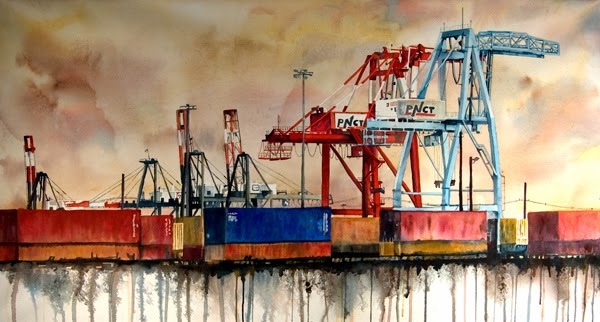 I am not sure what draws me to industrial scenes, but it is probably the colors and the structure of the equipment. I didn't want the blue crane to blend in with the sky so I decided to use a golden, gray colored sky. 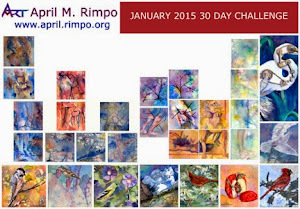 I love to use red and orange with blue to create tension with this red based analog color scheme. By using very dark values I accentuated the structure of the equipment and the train rail. Contrasting the geometric shapes of the freight yard with the soft sky and wet runs at the bottom of the painting provided an interesting balance between industrial and organic. 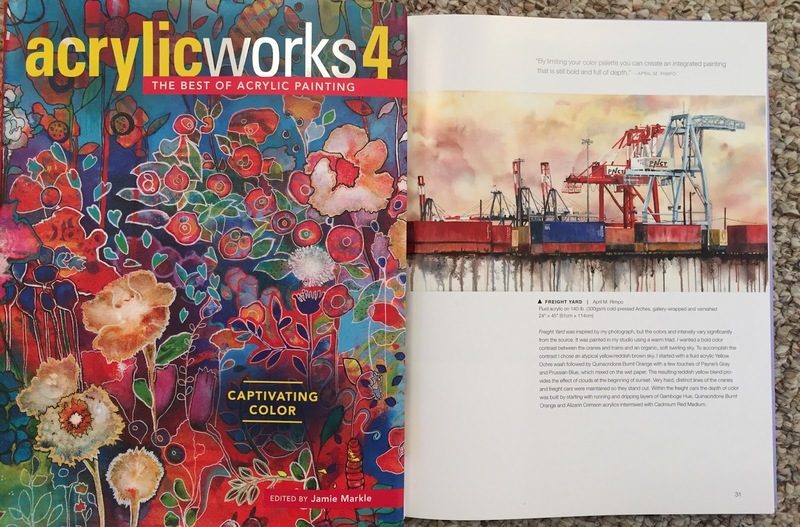 Freight Yard is included in North Light Books' AcrylicWorks 4: Captivating Color, best of acrylics. Read the press release for the book here. 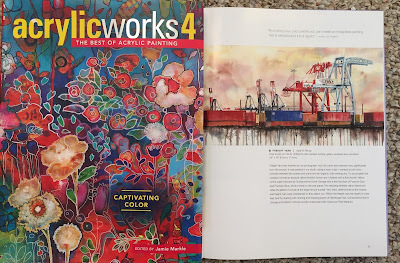 Below is an image of the cover and page 31, where my painting is included. To see a sample of my prints check my store. Anaother beautiful painting. I love this series you're doing. I think the mass of the structures is captivating in an adventurous way. The cranes are like mega mothers lifting our stuff up in their arms. Maywyn - What a beautiful way to describe the cranes. I wish I had thought of that. Thank you for your wonderful thoughts. Wow April! You've brought such a unique artistry to this scene! I love what you've done. I know what you mean about the appeal of the industrial buildings and the water towers and ladders and such. I like the abstractness of the lines flowing all around. This is beautiful! I'm so glad to hear you say this since I thought it was just me being weird and wondered if anyone else would like this subject matter. I had fun trying to bring together an organic feel to a very linear scene.